Capgras delusion is a horrible thing for a person and their loved ones to endure. The Science Satire Serpent believes the process that causes it is just an extension of healthy brain function. The Serpent believes we all have Capgras delusions, and we need them to prevent relationship difficulties becoming divorce. Capgras delusion, or Capgras syndrome, occurs when an individual believes one of their closest relations to be an impostor. They can see the impostor looks exactly as he/she should, but the ordinary emotional attachment to the vision is severed. The delusion is described as being temporary and caused by psychological pathology, drug (ab)use, physical injury or illness. Despite being popularised by (and popularising) V.S. Ramachandran following his 1997 seminal Proc Bio Sci co-authored publication with William Hirstein, such that the delusion even makes an appearance in episodes of Criminal Minds and Law and Order SVU, Capgras delusion is actually an extremely rare condition. So back to those PubMed hits for Capgras … what’s going on with all this Hollywood interest in Capgras delusion? There are only 16 publications listed on PubMed with the word ‘Capgras’ in the title—the same number as dracunculiasis (Guinea worm). You don’t see many TV dramas about Guinea worm. 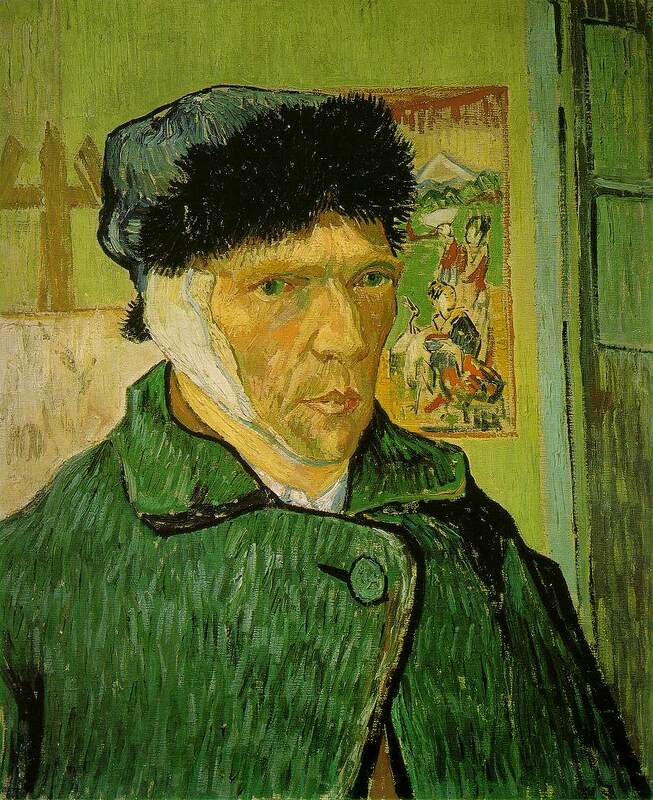 Vincent van Gogh displayed a Capgras-like state with regards to his ear. Body integrity identity disorder would explain why he believed it to be an impostor. You get the picture. PubMed focuses on health and disease. When a disorder, disease or delusion gets a measly 16 hits it is probably not even on the scale of global relevance— a bit like Hollywood. So why is Capgras delusion so popular in the mainstream media? Partly because it is a very weird and cool thing to think about, and partly because neuroscientists use Capgras delusional patients to tell us something intrinsic and general about brain function. While these researchers genuinely want to help people with Capgras delusion, the Holy Grail they are actually chasing is the link between brain structures and brain functions. But the Science Satire Serpent says that Capgras delusion is a vital stop gap for the dissolution of love and marriage. It is a healthy part of our brain’s anger and risk management team. Disclaimer: the following information is not based on patient research. These are original thoughts, in so much as one can have original thought. The Science Satire Serpent is not a neuroscientist or psychologist, just a bored immunology and satire weirdo. The Serpent has scanned the available literature, but not exhausted it. Angelina and Brad have been married and in love for many years. But one day Angelina discovers evidence that Brad has cheated on her. When she confronts him at the breakfast table he denies everything. He is innocent! But Angelina is in the worst state of mind imaginable and her rock solid love for him is crushed. The erroneous evidence causes her to believe him to be lying. There is a horrible fight with much broken crockery and spilled milk. They both lose their temper and hurtful nasty words are exchanged like ballistics between trenches. During the heat of battle Angelina is so infuriated and traumatised by Brad’s imagined actions and his inability to admit guilt or apologise that she shouts ‘Who are you?’ and ‘You are not the man I married!’, or ‘I don’t know who you are anymore.’. Sound familiar? It should. Even if you are not an Angelina or a Brad you have probably seen such stereotypical marital fights on bad TV. Thanks again Hollywood. Such statements are also the exact kind of things that Capgras delusional sufferers say to their loved ones, or at least about their loved ones, to their shrink. With the current understanding of Capgras delusion in mind we can now re-analyse the motivations and reasoning behind these statements. Prior to the current structure/function understanding of Capgras delusion we would have applied pure psychological analysis to understand our soap opera fight. But thanks to V.S. Ramachandran and William Hirstein we can now apply a structure/function understanding. The Science Satire Serpent says that Angelina is in a moment of relationship-induced Capgras delusion. While she can see Brad in front of her, the usual emotional response triggered by his face is inhibited so the person before her seems like an impostor. Her brain deliberately does this to her, temporarily, as a protective mechanism. It has taken years and much energy to establish Brad as a lover, a trusted companion, and part of her own identity. Even if she cannot process it at the time, her brain recognises that the fight is just one small and potentially inconsequential moment. But the gravity of the negative emotion of the encounter forces her brain to shut down the link between visualisation of Brad’s face and emotional activation—it could do this in exactly the same way that clinical Capgras delusion deceives. In other words, Angelina’s brain realises it is not worth risking the loving image of Brad over this one incident. Once the incident is resolved the brain signalling is restored and again Angelina will recognise Brad as the man she loves. This is why so many partners are forgiven their indiscretions, imagined, real, or not. It also explains why during marital fights the combatants experience temporary desire for divorce. This is healthy delusion. At that moment, in their mind, they are effectively married to a deceitful copy of their lover—they are at the mercy of a dopplegänger. Therefore could it not be correctly stated that we all suffer transient bouts of Capgras delusion? This could be a healthy and ordinary brain function designed to prevent relationships cascading over a precipice following rocky rapids. The delusion only becomes pathological when caused by injury or illness and is thereby misplaced and extended in time. 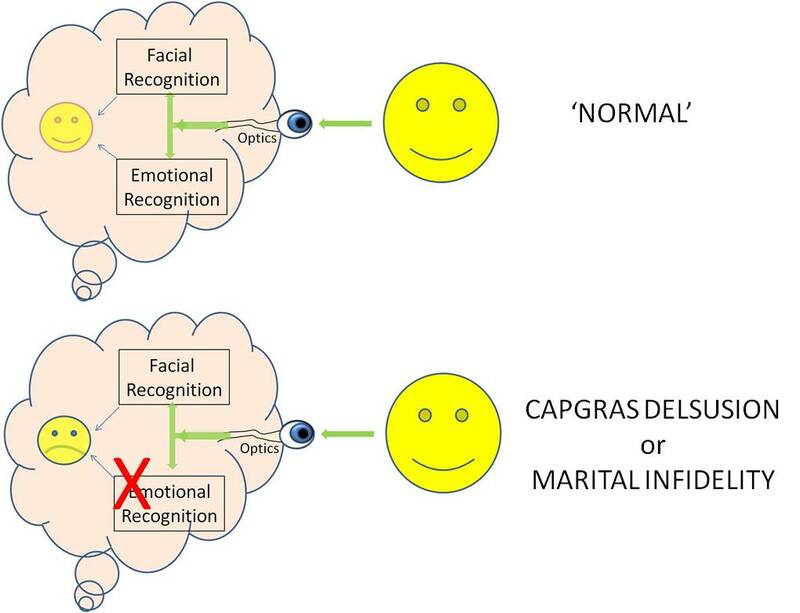 So is Capgras delusion really just an inherent function of healthy brain activity? The Science Satire Serpent says you all have Capgras like delusions—perhaps this perspective is beneficial for our understanding of both Capgras delusion and relationship issues. Finally, many thanks to Professor Hirstein for taking the time to comment on this article. He is obviously a very busy man but clearly also a fantastic guy for engaging in this discussion. If you are keen to know more about his latest research into Capgras delusion then his 2010 publication “The Misidentification Syndromes as Mindreading Disorders” can be accessed from Cognitive Neuropsychiatry. For other Science Satire Serpentry go HOME, go on, off with ya! This is fascinating, and the shifts in position of the man who produced the original study, you’ve included now, make the implications of this seem even more significant – in terms of personal human interactions and larger political formations.